Here are my thoughts on the 2015 election campaign just over two weeks from the poll. If Ed Miliband does become prime minister in May 2015, he should send a thank you card to Tory HQ. The Conservative campaign has been a series of misjudgements. The worst was defence secretary Michael Fallon’s disgraceful attack on Miliband. Fallon said that the fact the Labour leader ‘stabbed his brother in the back’ by contesting the party leadership, meant he’d stab the country in the back over defence. Fallon’s claim was risible. By the same token, Margaret Thatcher was as guilty by challenging Edward Heath in 1975. But it’s unlikely the excitable Fallon would have spotted this. His foolish attack actually strengthened Miliband, who brushed off the attack with dignity and skill, praising Fallon as a decent man who had demeaned himself with the attack. This negative campaigning rarely succeeds – and in the case of the Tories led to an even more ill judged set of expensive promises in an attempt to present a more positive offer to the electorate. Back in 2010, few people would have expected Britain to escape mass unemployment in the following five years. Yet observers have been impressed by the coalition’s economic record. IMF chief Lagarde praised Britain’s economic results. Most polls suggest the Tories are most likely to be trusted with the economy. So what does that party do? It risks throwing away its reputation with a series of expensive bribes – such as spending an extra £8 billion on the NHS and some £12 billion in forcing housing associations to sell off homes. All these promises are unfunded. And as Dominic Lawson said in today’s Sunday Times [paywall content], “There is something deeply un-Conservative in compelling private ventures to dispose of property and assets”. SNP leader Nicola Sturgeon has been the star of this election – even though she’s not standing. (She sits in the Edinburgh parliament, not Westminster.) She flourished in the debates, much as Nick Clegg did in 2010. True, she’s had a fairly easy ride, but she’s skilfully dismissed the lazy jibes of predictable London opponents. The Tories have desperately tried to portray the SNP as puppet masters of a Miliband government. Labour, facing wipeout in its old Scotland heartland, has equally desperately sought to dismiss the idea it would do a deal with Sturgeon’s party. The rise of the SNP is one of the most extraordinary tales in British politics since Labour displaced the Liberals almost a century ago, Sixty years ago, the Tories had the most seats in Scotland. In 1997, Labour crowed at the Conservative wipeout north of the border. Now it is facing its own massacre. The right wing press is limbering up to accuse the SNP of acting illegitimately in choosing which party to support in Westminster. That accusation is ill founded. If no party can command a majority in its own right, then other parties have the right to create alliances – whether formal coalitions as in 2010 or informal ones such as the 1970s Lib-Lab pact. Scotland remains part of the UK, and its largest party has the right to vote for Labour against the Tories – even if the latter won the most seats or votes. As this campaign began, I thought the Tories would form a minority government. But Labour’s success has made me think again. I expect Ed Miliband to be prime minister after the election – probably leading a minority government under confidence and supply arrangements rather than a formal coalition. We shall see. This entry was posted in Politics and tagged #GE2015, David Cameron, Ed Miliband, General Election, Nicola Sturgeon by Rob Skinner. Bookmark the permalink. I have a feeling certain newspapers will be keen to find as many of those hens as possible to see if they are all Miliband fans. Good observations on Ed and the Tories Rob. 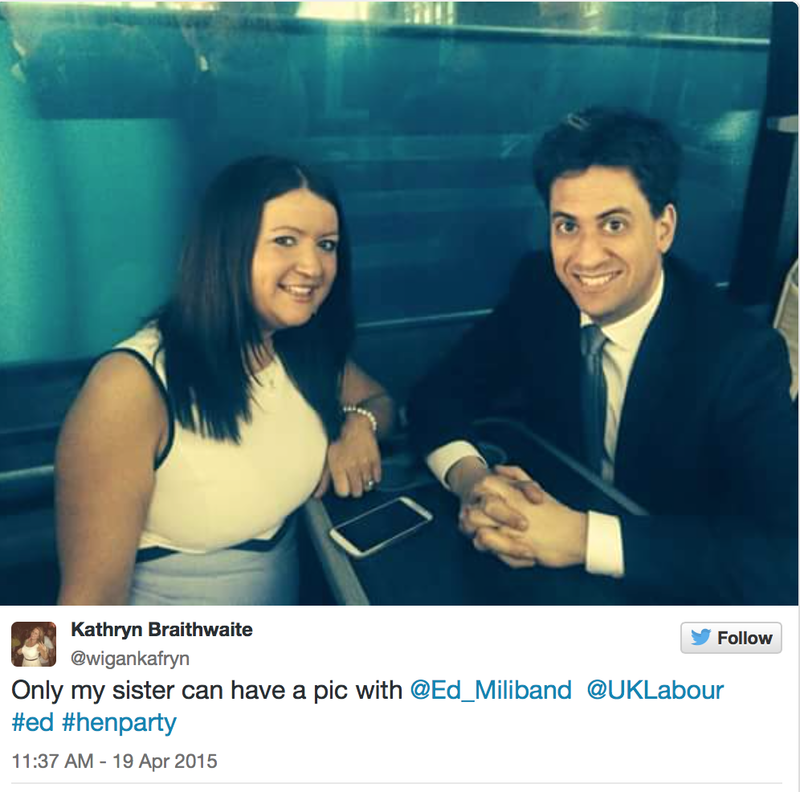 I just wish Ed would relax a bit more however he is clearly made of Teflon and has grown in stature. As for Nicola Sturgeon – we had the Iron Lady – now we have the Irn Bru Lady. She’s good but getting to be a bit smug about it. It’s a pity she wants to break up the Union. I like that…I could have written it. But I still don’t wanr to hear any more about the……….election!